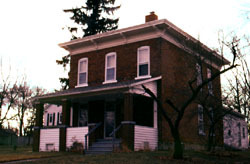 A National Historic Landmark, this house was the home of Wilson Bruce Evans (1824-1898), a leading black abolitionist and successful member of Oberlin's commercial and educational communities. Wilson Bruce Evans and his brother Henry Evans were participants in the well-known 1858 Oberlin-Wellington Rescue. This rescue of an escaped slave, who had been captured and was to be taken back to his master in Kentucky, was one of several open and well-publicized confrontations over the Fugitive Slave Act of 1850 and was significant in fueling the sectional differences in the United States prior to the Civil War. Wilson Bruce and Henry Evans were born into freedom in Fayetteville, North Carolina and learned the trade of cabinetmaking and carpentry as young men. 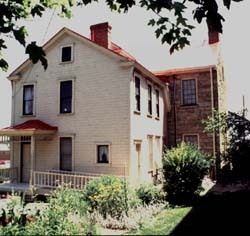 In 1854, they moved with their respective families to Oberlin, a college community known for its support of free blacks, and established a cabinetmaking and carpentry business. The two brothers were not outspoken abolitionists like Harriet Tubman, Sojourner Truth, or Frederick Douglass, however they risked imprisonment to fight slavery and the Fugitive Slave Act. The desire of the Evans' to help their brothers and sisters held in slavery was put above their own personal safety. 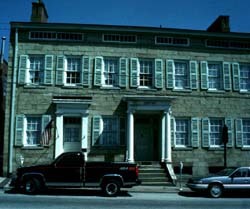 The Wilson Bruce Evans House is located in Oberlin, Ohio at 33 East Vine Street. The property is a private residence and is not open to the public.